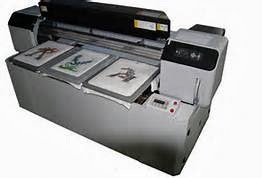 Digital garment printers (DGP), also referred to as direct to garment printers are basically inkjet printers such as the ones connected to most desktop computers, except for size and some technologies and features which deal with printing on fabric, usually cotton or cotton/poly blends. We use DGP for all the cotton and cotton/poly apparel and accessories found at The Motto Shop. A better feel, more like or identical to the fabric it is printed on as the ink is actually printed into (absorbed by) the fabric rather than setting on top of the fabric like screen prints - more comfort overall, particularly when perspiring or when worn in hot or cold weather. A more authentic representation of the original image is produced using an auto-matching inking process rather than depending on color mixing from a limited range of colors. Better able to capture color variances such as gradients and shadows - definitely beneficial with our logo design. No set-up fee (such as creating screens) which may be cost prohibitive for small orders. We only use digital garment printing on lighter color shirts, but will evolve into darker colors over time as this challenge is met and proven by the manufacturers. DGP may not maintain its brilliance as long as screen printing, but we choose cotton/poly blend fabrics, which tend to maintain color longer, whenever feasible. We will consider using screen printing for orders over 30 plus items, special requests for darker color garments or if doing so makes good economic sense. You can always inquire or make a requesting by contacting us. We use dye-sublimation for our wicking (moisture management) clothing and only in white, which is currently the only economical color to use, for us and our customers. Because of the process, a very slight indention is left outside of the logo or print area. We wouldn't even do this if the logo didn't look so darn good on these materials - it is so brilliant and clear. Feel free to contact us with any questions regarding this or anything else about The Motto Shop products.